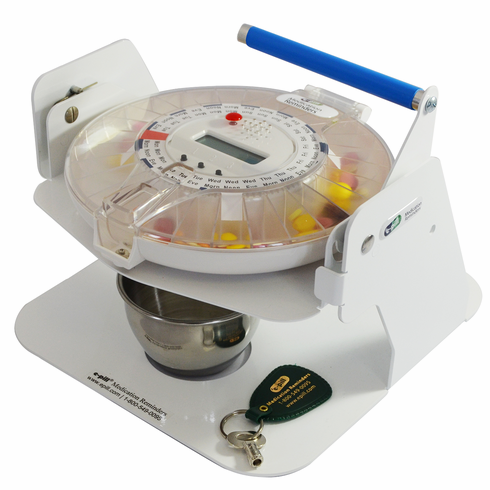 Help Mom or Dad Stay Independent with this Locked Automatic Pill Dispenser for all Medications. The new e-pill MedTime STATION is an Easy to Use Locked Pill Dispenser from e-pill Medication Reminders. When it is time to take your medications, the device will alarm, prompting the patient to pull the blue handle on the tipping device. The pill dispenser is then rotated and the pills fall out into the stainless steel cup (included). The e-pill MedTime STATION alarms up to 6 times per day. After initial set-up, the machine automatically repeats the alarms every day. The tray inside the dispenser holds 28 Medication Events, or doses (see the filling chart below for more information). Never Forget or Double Dose Again! Learn more: Longer Video (90 seconds). How-It-Works: When the alarm is sounding and the light is flashing, simply move the blue handle forward to dispense medications into the medicine cup. Pills drop into the medicine cup when the handle is moved forward. The alarm/blinking light is automatically turned off. That's it! The e-pill Station has sticky feet that help it adhere to a surface. The pill dispenser should be kept locked. The e-pill Station comes complete with everything you need: the automatic pill dispenser, keys (2), tipper with handle, stainless steel medicine dispensing cup, dosing templates, batteries (4 x AA) and manual. More Information: The e-pill MedTime STATION Automated Pill Dispenser is Easy to Use for all patients. Since it rests on a tipping device, it also works well for patients with limited vision or dexterity. The clear cover allows caregivers to easily see when doses were missed. Capacity: Holds 18 Aspirin sized tablets per Dose. Max 6 Doses ('medication events') per Day. Battery life: 6 Months - 12 months (4 x AA are included) with Low Battery Warning Indicator showing one month before time to change batteries.